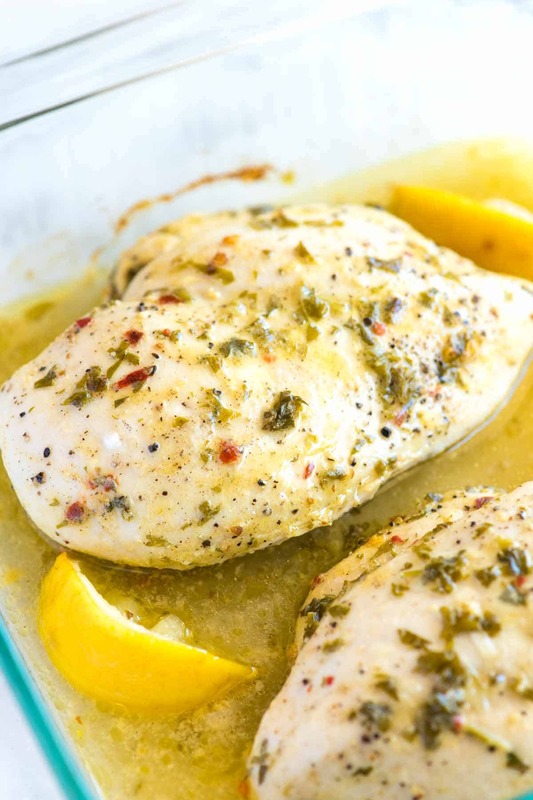 Say goodbye to dry, flavorless chicken and hello to this easy and flavorful oven baked chicken breast recipe with fresh lemon, garlic, and olive oil. 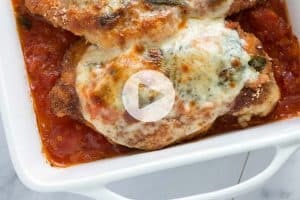 How to bake juicy and tender chicken in the oven. Jump to the Lemon Garlic Baked Chicken Breast Recipe or watch our quick recipe video to see how we make it. It’s no secret that we love sharing chicken recipes with you! If you haven’t seen our recipes for Lemony Chicken Breasts with Cucumber and Feta Salad or Baked Chicken with Roasted Red Peppers yet, you should. And if you love chicken thighs, take a look at our Oven Baked Chicken Thighs — it’s insanely good. 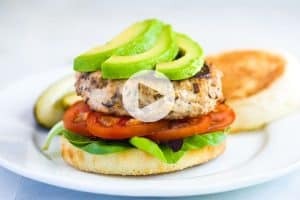 When it comes to skinless, boneless chicken breasts, there are three secrets for making sure they come out juicy, tender and full of flavor. Read on to find out how to make juicy, tender, and flavorful baked chicken breasts! In our recipe below, we share a marinade made of fresh lemon, garlic, and Dijon mustard. It’s best to marinate chicken breasts 1 to 2 hours before baking. There isn’t a need to go longer than that. 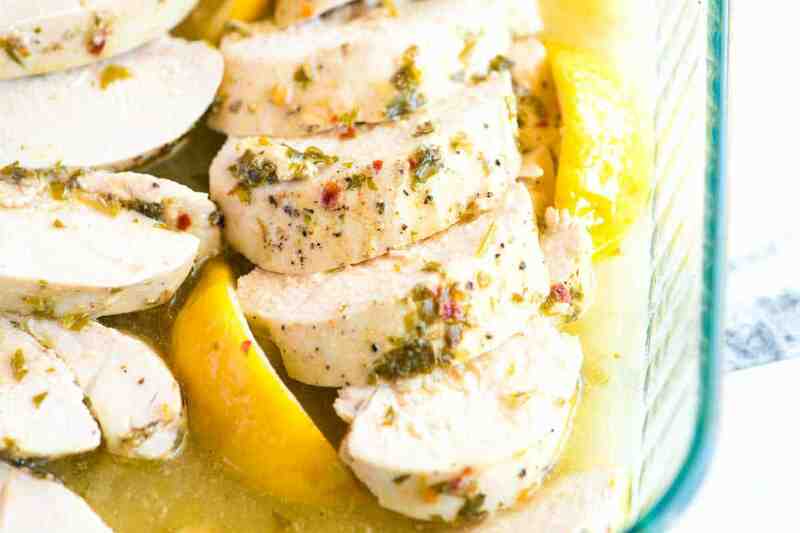 We’ve shared this marinade recipe before — see our Easy, No-Fail Lemon Chicken Marinade Recipe. This tops our list as our favorite marinade. 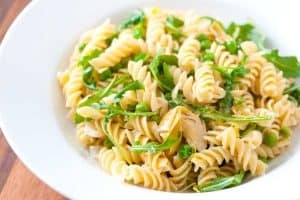 It’s a magical mixture of fresh lemon, garlic, Dijon mustard, and parsley. The marinade works wonders with all cuts of chicken as well as pork, by the way. A definite keeper! Here’s another favorite marinade: These Garlic Basil Baked Chicken Breasts are easy and absolute perfection. After marinating, we loosely cover the chicken with parchment paper — aluminum foil is a good alternative. By loosely covering the chicken, the chicken breasts roast and braise at the same time. This means the chicken bakes in its juices, keeping the chicken breasts juicy, tender, and never dry! How long you need to bake chicken breasts will depend on how large they are. We like to check for doneness around 25 minutes then go from there. Most chicken breasts will take 35 to 40 minutes to bake. Here is where an internal thermometer comes in handy. You only want to bake the chicken breasts until the thermometer reads 165 degrees F. If you bake it past that, they will most certainly be overcooked, which means they will be dry and flavorless. Investing in a thermometer is the absolute best way to guarantee you won’t overcook the chicken. Ours cost us less than $15, and in my opinion, it’s one of the best purchases we’ve ever made for our kitchen. Do those three things and you can say goodbye to dry, flavorless chicken and hello to healthy, juicy chicken breasts that you will love! 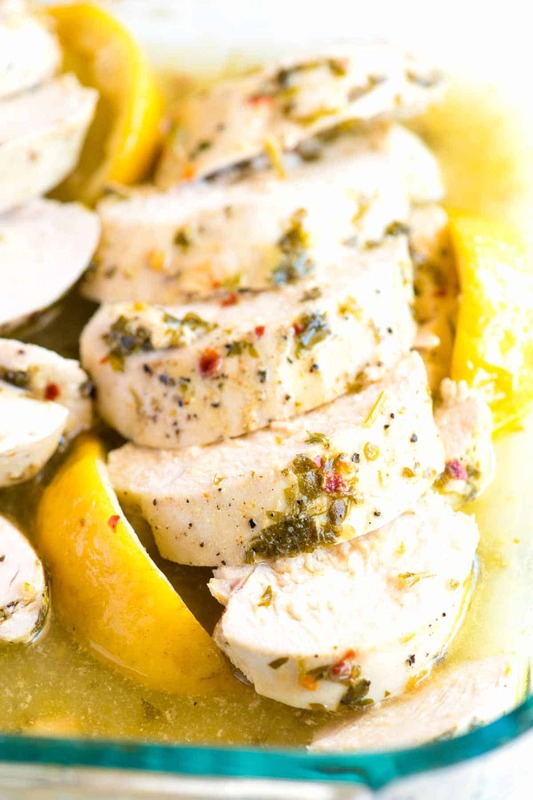 See how we make ultra tender lemon chicken in our slow cooker with a lemony chicken gravy. 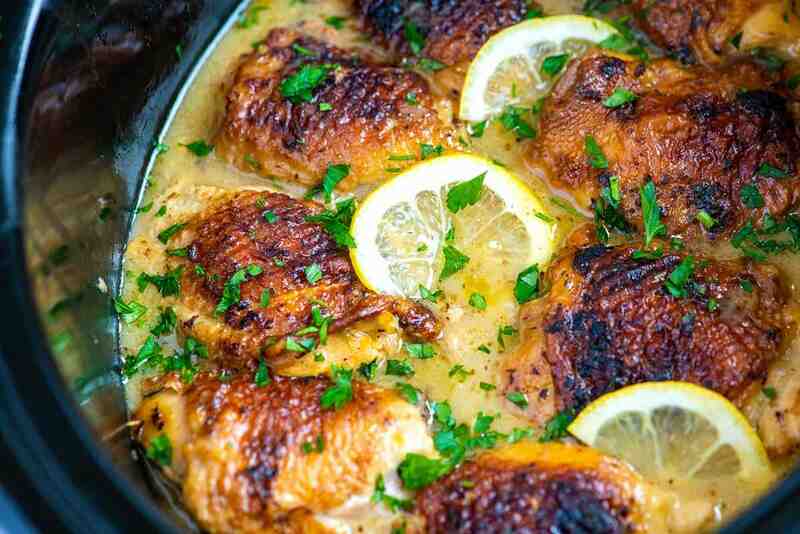 See the Ultimate Slow Cooker Lemon Chicken Thighs Recipe. For the best, juicy, and tender chicken breasts remember these three things: marinate first, bake loosely covered, and use a meat thermometer. 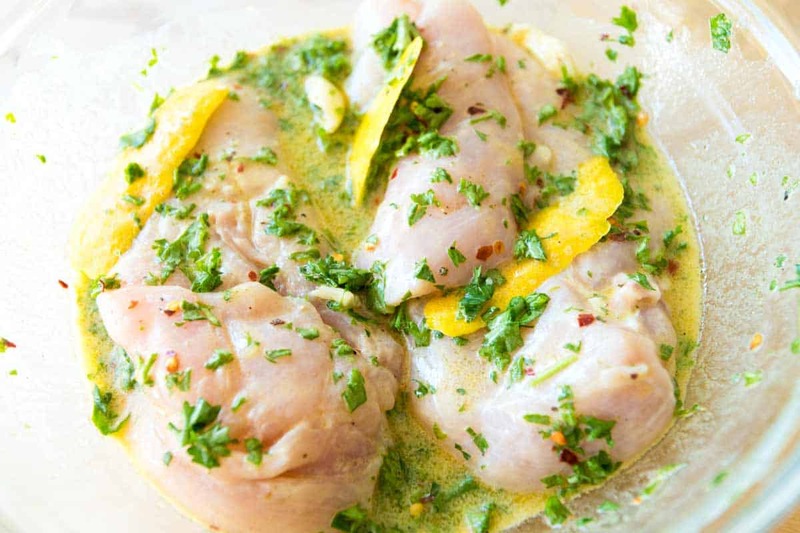 We marinate the chicken breasts in a magical mixture of fresh lemon, garlic, Dijon mustard, and parsley before baking in the oven. If you’re short on time, marinate as close to an hour as you can. If you’re flexible, go for a whole two hours. And since we want to keep things safe, it’s best to marinate the chicken in the refrigerator (no matter how long you do it for). We highly recommend using an internal thermometer when cooking meats. Peel or zest the thin, yellow skin (zest) from 1 lemon, and then juice the lemon so that you have 1/4 cup of fresh lemon juice. (Use half of the second lemon to make up the 1/4 cup of juice if the first lemon was not enough). Whisk lemon juice, olive oil, mustard, salt, red pepper flakes, and black pepper together until the salt has dissolved. Stir in the garlic, lemon zest, and parsley (if using). Refrigerate and use within 1 to 2 hours. Add the chicken breasts to the marinade and marinate for 1 hour and up to 2 hours in the refrigerator. Position oven rack in the middle of the oven and heat the oven to 400 degrees F. Oil a baking dish large enough to fit the chicken breasts arranged in one layer. Oil one side of a sheet of parchment paper that is large enough to cover the baking dish. Quarter the second lemon. Transfer chicken breasts to the prepared baking dish and remove any large pieces of garlic that might be stuck to the chicken. Season the chicken with salt and pepper, scatter lemon wedges around the chicken then cover with parchment paper — oiled side down towards the chicken. 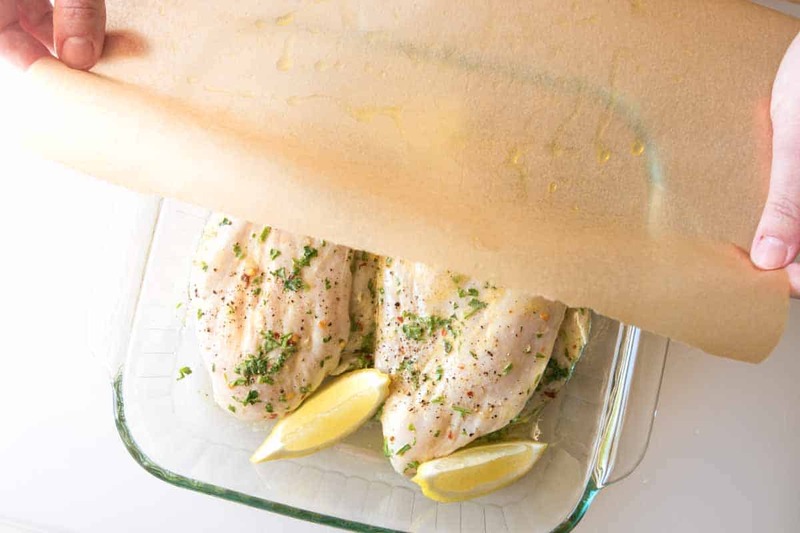 Loosely tuck the parchment paper around the chicken. Bake until the chicken is opaque all the way through and an internal thermometer reads 165 degrees F when inserted into the thickest part of the breast. Check for doneness around 25 minutes then go from there. Most chicken breasts will take 35 to 40 minutes. Let chicken rest about 10 minutes then serve drizzled with some of the liquid left in the baking dish or slice the chicken and place back into the baking dish with all the leftover cooking liquid (our favorite). Followed directions but added a bit of chopped fennel with the parsley. I didn’t like the dish…too bitter,too spicy. My husband loved it. Amazing!! Didn’t brine first and didn’t add salt onto the chicken and all came out moist, tender, and super tasty!! Is my new go-to ckn recipe. We loved this recipe and will make it again. Made this tonight for dinner. Served it the chicken over rice. Absolutely delicious. Will definitely make it again. Loved this! Served it over angel hair and once over cheese/spinach stuffed tortellini with pesto sauce on both dishes. Delicious!!! This was tender and delicious. A successful recipe! Made this a couple of nights ago, it’s very tasty. Thanks! This was easy to prepare. My husband said it was the best chicken he had tasted in a long while. My teenaged daughter, who usually only eats a few bites of any meat I prepare, ate an entire breast, then she ate half of another. My husband said he wants to have it again next week. Thank you for posting this, it is so hard to find a recipe that satisfies everyone in my family! I just made this, it was fantastic. I actually just cooked one breast in the toaster oven on a pan, but I covered the chicken in foil after spraying it with oil. Thanks for the recipe! Rare to come across someone with the name Feeny, which part of our family tree do you come from? Ireland, Birmingham, somewhere else? I am marinating my chicken now for dinner tonight. 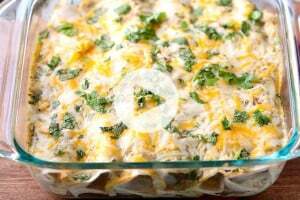 This looks so delish and your recipes have all been successful so I’ll be trying this very soon!